Just like a song or a person, I can associate a perfume with nearly every destination I’ve visited. My discovery in Milan was Prada’s Infusion d’Iris. Bright Crystal by Versace always reminds me of a trip to Reykjavik, while New York will forever be Hypnose by Lancome. It’s easy then to see why I couldn’t take a trip to the fragrant south of France without paying a visit to the prestigious Galimard Perfumery in Grasse. Established in 1747 by Jean de Galimard, it is the oldest perfume company in France and the third oldest in the world. Better yet, the perfumery offers workshops where you get the chance to create your very own perfume. Perfume making, as I came to appreciate, is both an art and a science. For the duration of the class, you sit at a “perfume organ”, a three-tier collection of 127 different scents, or ‘notes’ as they are known, that you test individually and then harmonize to create your signature scent. For two hours I got to play at being Coco Chanel, sampling scents on tester paper before mixing and distilling from lab beakers to graduated cylinders. A splash of Jasmine, a drop of Ocean, a hint of Bamboo – chemistry was never this much fun at school. The array of scents can be slightly overwhelming, especially considering that just a handful will make the cut. Fortunately though, you are guided by a fragrance expert (or ‘nose’ as they are officially known). In my case, it was Nathalie Nestler who explained the process as well as the differences between peak, heart and base notes. Like all ‘noses’ she had been trained to recognise thousands of scents so offered an excellent second-opinion when it came to choosing the right notes. Base notes: These are the first fragrances that are added and make up the bulk of the overall scent. This is the scent that lingers on your clothes the next day. Heart notes:The second group of fragrances that are added. They are ones that will be most noticeable during the hours after you have sprayed the perfume and provide the essence of the scent. Peak notes: These are scents that you get on first impression when you spray the perfume. They are the last fragrances to be added to the perfume and last the least amount of time. After deliberating about whether to add a fruity shot of “cocktail” as a heart note ( on the advice of Nathalie I settled instead on a more subtle lychee), I was then given the final task of naming the perfume before Nathalie whisked the mixture away to the lab to be bottled and labelled. Et voilá, the finished product – a delicate, sweet but also fruity fragrance that kind of makes you happy when you get a burst of it. There could only be one name for it: “Summer Edit”. There really are very few travel experiences where you come away with such a unique souvenir. And there’s no need to despair when you run out of your perfume. Galimard keep all guests’ creations on file so they can be easily re-ordered as perfume, hand-cream or shower-gel. Plus you receive a certificate as a memento which also includes the reference number of your fragrance. The town of Grasse is an easy daytrip from larger cities such as Nice and Cannes and takes between 45 minutes to 1-hour to reach by local bus. 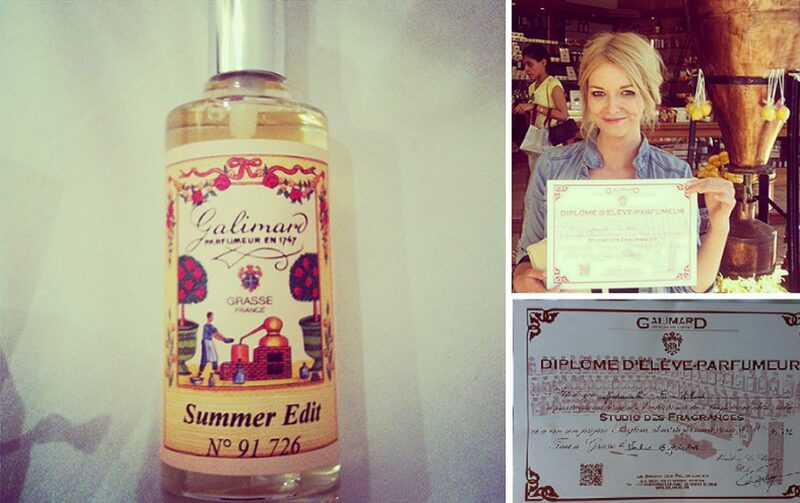 A 2-hour perfume making workshop at Galimard costs €45 including tuition and a 100ml bottle of your creation. Special thanks to Galimard and Nathalie Nestler for this superb workshop. That is pretty cool that you can make your own bottle. Definitely a great way to personalize the experience and nice that you can take a memento home. That’s interesting the way the three scents come together to make the perfume. I guess I should say three “notes.” I agree that if a practical, hands-on experience like this would have been part of chemistry education more kids might do better in class. Yes, I never knew there were so many layers to perfume, it was a real education! Oh I’ve always wanted to do this! Mine would be a combo of whatever makes it chocolate-y + that lychee note at the end sounds delicious.. lol. I hope that would translate to a good smell too. Guess I’ll have to go and try it for myself one day. Yes, it’s really worth doing. Chocolate sounds interesting! I’ve always wanted to do this! It sounds like so much fun. Who knew it was so complex? I actually created a perfume once in a workshop… although, I didn’t receive a certificate and can’t re-order, learning the ins and outs was truly fascinating… happy to learn this workshop exists… thanks for sharing..